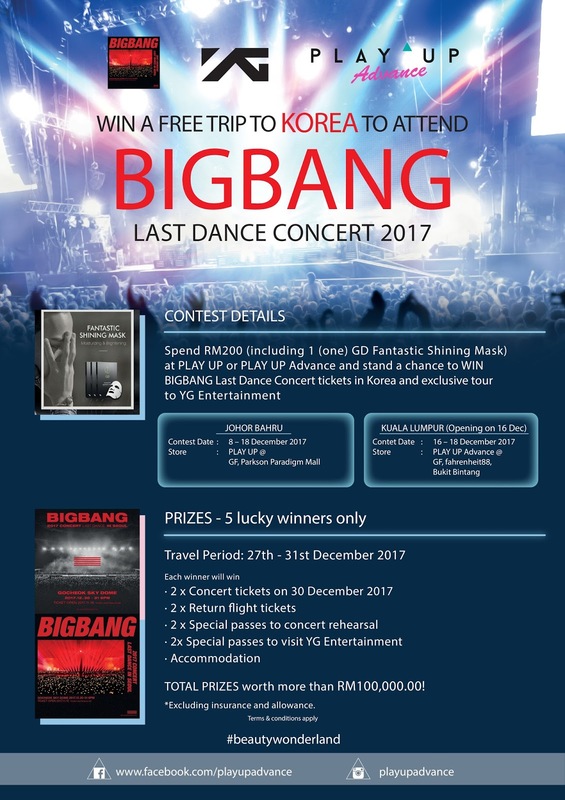 GOKPOP | Exclusive K-News in Malaysia & Singapore: Your Chance to Watch BIGBANG 2017 LAST DANCE IN SEOUL With Your Friends! Your Chance to Watch BIGBANG 2017 LAST DANCE IN SEOUL With Your Friends! All you have to do is spend RM200 @ PLAY UP Fahrenheit 88/ Paradigm Mall Johor Bahru, fill up the contest form & drop it in the contest box, you might be one of the lucky fans to have this experience of a life time!! ✨ PLAY UP Advance @ Fahrenheit 88 will be opening on 16 December. ✨ The RM200 purchase must include at least one GD Fantastic Shining Mask. ✨ Contest ends on 18th December 2018 & winners will be announced on 20th December 2017.